Instead of wasting leftovers, transform them into a unique and savory side dish worthy of entertaining and simple enough to make any night of the week. Place griddle plates on the grill. Use switch at bottom right rear of grill to make flat surface. Close cover and set cooking temperature at 425°F and cooking time for 5 minutes. Allow grill to preheat for 5 minutes. Stir together potatoes, cheese, bacon, peas, onion, egg and 1/4 cup of the flour until well combined. Divide into 12 equal portions and shape into balls. Flatten each ball into a 1/2-inch thick patty. Place remaining flour in a shallow bowl and coat outside of each patty; gently shake off any excess. Place on greased griddle and brush tops with olive oil. Close the cover and cook for 5 minutes or until crisp on the outside and warm on the inside. 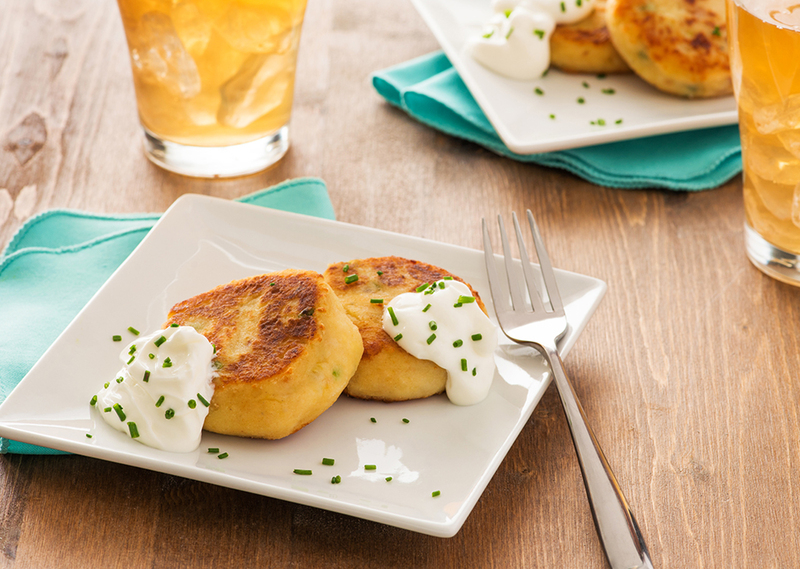 Serve with sour cream sprinkled with chives. Tip: If mixture isn't holding together because it's too wet, add additional flour, 1 tbsp at a time, until the mixture is cohesive. If it's too dry, add a splash of milk.